PULLMAN, Wash. – When Justin Denney was still an aspiring, young sociologist, he strove to understand the dynamic forces that shape and perpetuate social inequality. PULLMAN, Wash. – Following is a list of concerts and performances offered Nov. 6-11 through the WSU School of Music. Mark your calendar and make plans to attend. PULLMAN, Wash. – Award-winning comedy writer, director and producer Ted Tremper will be the featured Visiting Writer Series speaker 5:30 p.m. Thursday, Nov. 2, in Daggy Hall’s Wadleigh Theatre. PULLMAN, Wash. – The Washington State University Common Reading Program hosts “The Future has Always Been Female: Mary Shelley, Ada Lovelace, and the Origins of Science Fiction and Computing,” a lecture by Roger Whitson, 4:30 p.m. Monday, Sept. 18, in CUE 203. RICHLAND, Wash. – Peter Christenson, assistant professor of fine arts at Washington State University Tri-Cities, has received the Governor’s Arts & Heritage Young Arts Leader Award from the Washington State Arts Commission. 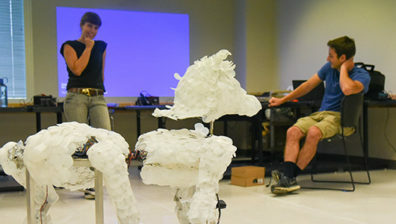 RICHLAND, Wash. – “The Huminal,” an interactive, kinetic sculptural installation featuring an autonomous, mobile robot that senses and responds to changes in its environment, was completed this month by an interdisciplinary team at Washington State University Tri-Cities.